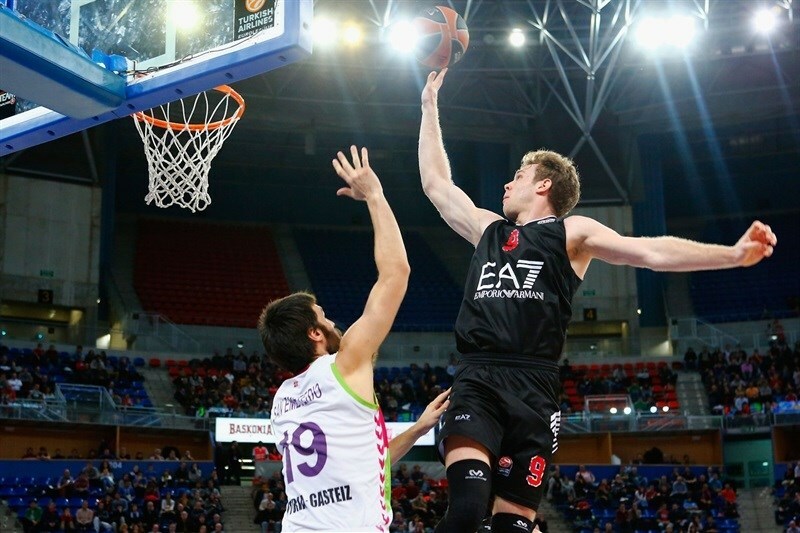 Davis Bertans scored 16 points in the first five minutes of the game and Laboral Kutxa Vitoria used a huge first half to run away from EA7 Emporio Armani Milan en route to a 102-83 victory on Thursday night at Fernando Buesa Arena. 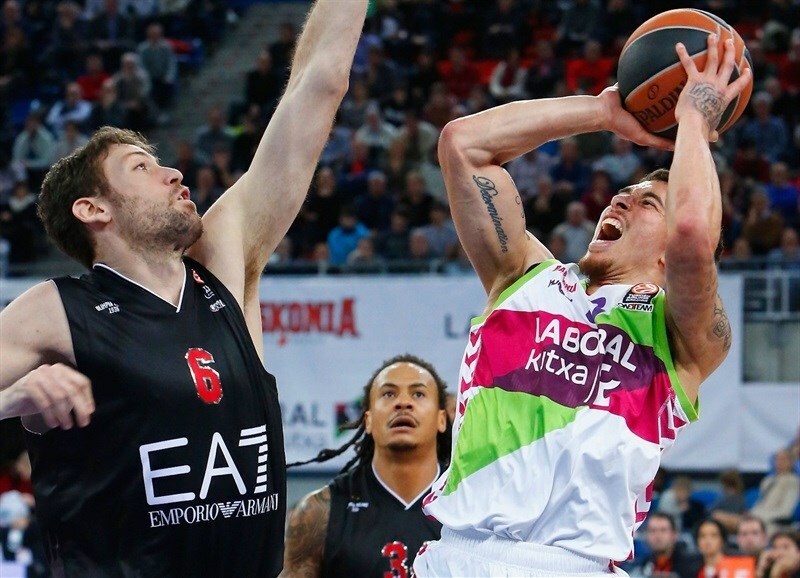 The win improved Laboral’s record to 2-3 in Group F, while Milan dropped to 1-4. Laboral led from start to finish, opening the game with a 10-0 run and behind 4-of-4 three-point shooting from Bertans built a 34-18 lead after the first quarter. The hosts extended the margin to 22 points midway through the second, and by missing only 9 of 31 shots from the field in the first half, held a 61-42 halftime lead. The hosts never looked back, having led by 29 points in the fourth quarter before Milan cut back the deficit at the end. 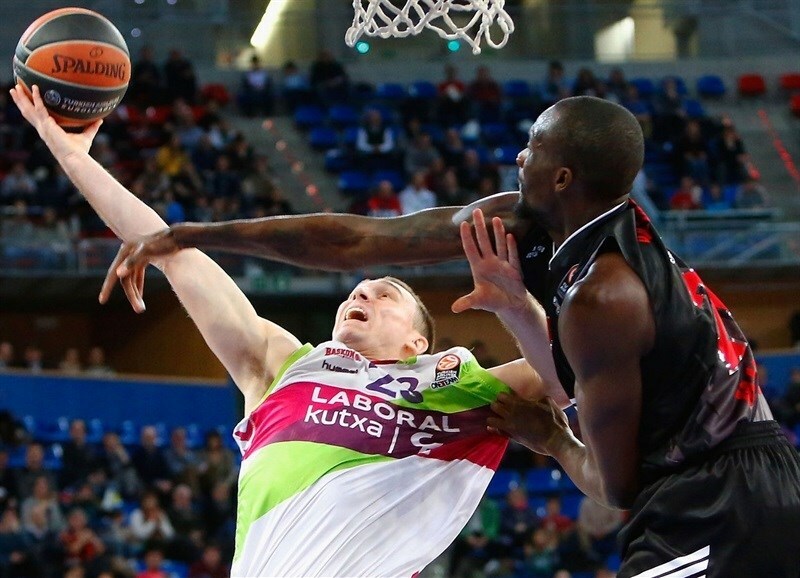 Bertans finished with 19 points in only 16 minutes to lead all scorers, Mike James scored 16, Darius Adams hit 4-for-6 from downtown for 15 points, and Fabien Causeur scored 12 in victory. 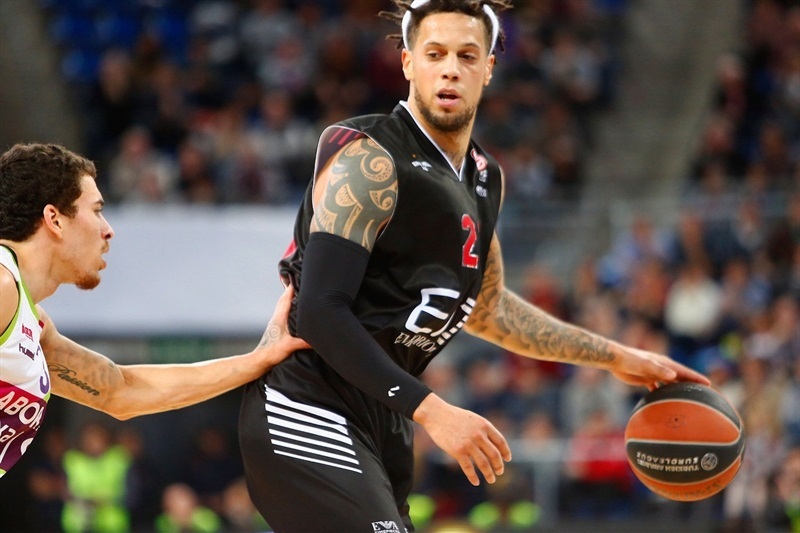 Samardo Samuels fought for 18 points plus 8 rebounds for Milan, Alessandro Gentile scored 15, and Linas Kleiza collected 14 points and 8 boards. Laboral stormed out of the gate. 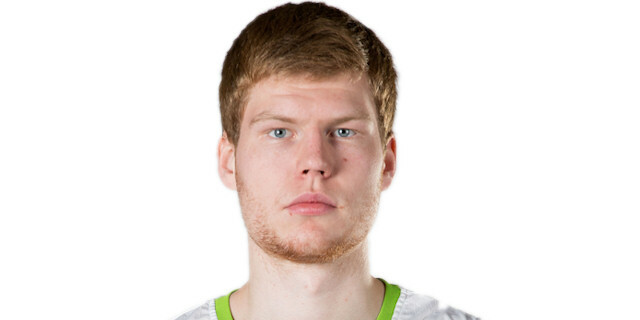 Bertans drove for a layup, then hit back-to-back triples to lead 8-0. 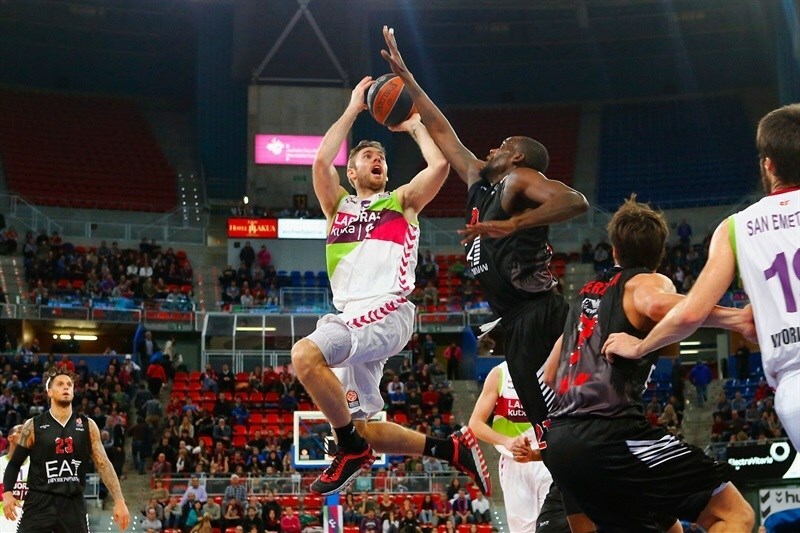 Colton Iverson scored inside to extend the lead to 10 points, before Samuels opened Milan's tally from close range. Daniel Hackett followed with a runner, but Bertans hit another triple and Causeur drove for a layup and a 15-4 advantage. After a timeout, David Moss hit a corner triple for the visitors, and Milan tried a matchup zone on defense, but Bertans was not bothered, hitting his fourth triple in as many attempts. 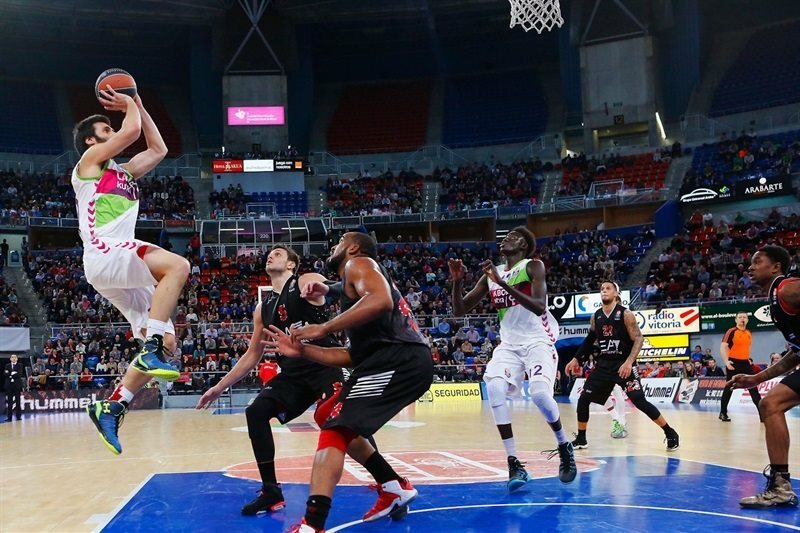 Gentile answered from downtown for his first points of the night, but Bertans used a backdoor cut for a reverse layup that got his personal tally to 16 points and gave Laboral a 20-10 lead after only five minutes. Hackett and Gentile made free throws, but James hit back-to-back jumpers for the hosts, and Adams buried a second chance three-pointer to make it 27-14. After Gentile hit a jumper for the visitors, Fernando San Emeterio went 4-for-4 from the foul line, and Adams beat the buzzer with a three-pointer for a 34-18 lead after 10 minutes. The scoring slowed down early on in the quarter. MarShon Brooks hit a jumper for Milan, and after Kim Tillie came up with a monster dunk for the hosts, Brooks had a put-back that made it 37-22. 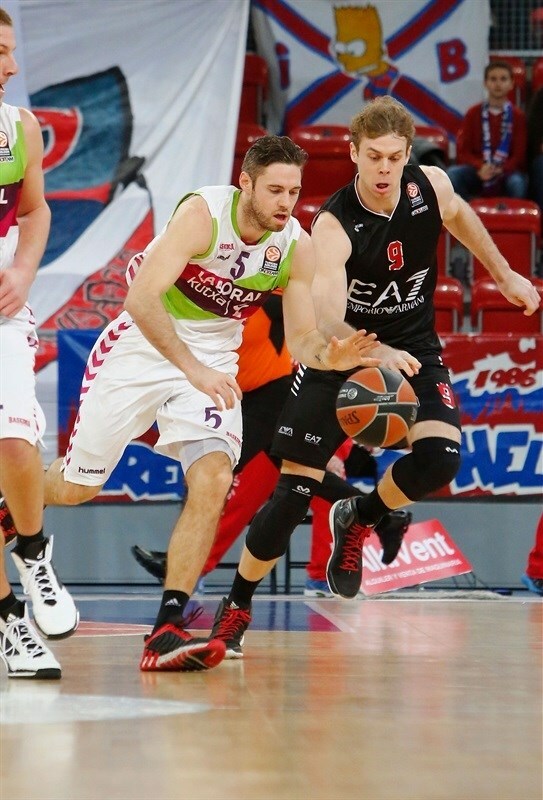 Milan tried to be more aggressive, applying pressure on defense, but a Tillie triple and a tip-in by Mirza Begic extend the margin to 20 points. After Brooks drove through the crowd for a layup, Causeur countered with a pair of floaters for Laboral. However, Milan needed only 42 seconds to get back in the game: Gentile hit a corner triple, and Hackett scored a fastbreak layup and drew a foul. 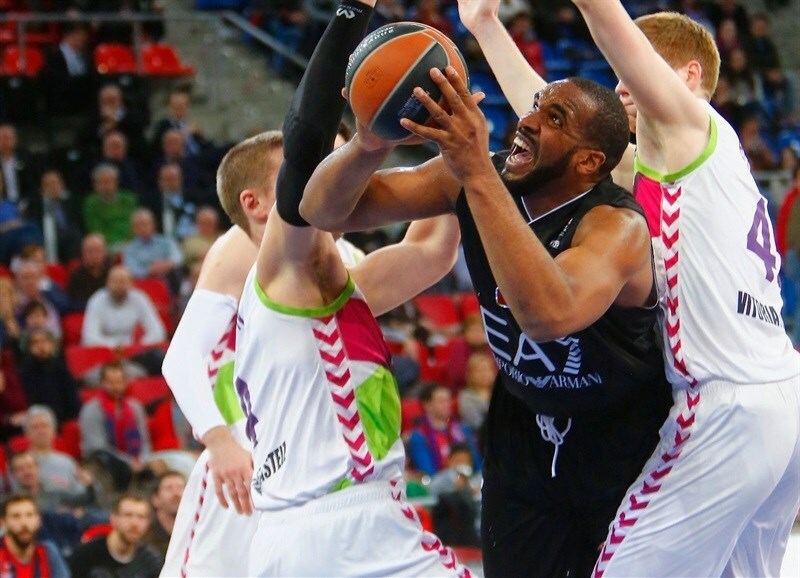 He missed a free throw, but Kleiza secured the rebound and Samuels fought for a layup, before Kleiza capped a 0-10 run with a triple that made it 47-35. 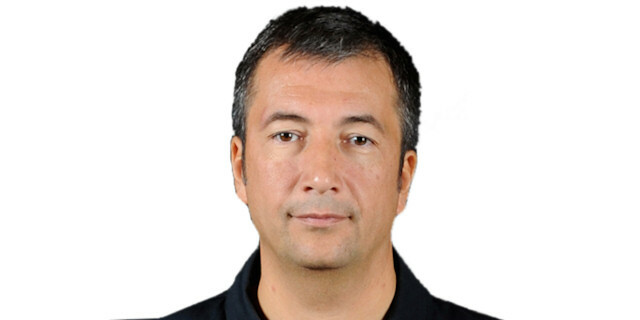 After a timeout by Laboral coach Ibon Navarro, James and Tillie hit jump shots to get the margin back to 15 points. Samuels and Iverson traded baskets inside, and after foul shots from Samuels, a three-point play by James increased the lead to 56-40. Samuels fought his way inside to string his seventh straight point, but Causuer made a couple of free throws and James beat the buzzer with a three-pointer for a 61-42 halftime lead. James and Tornike Shengelia each scored a pair of free throws in the opening minute of the second half, with Gentile driving for a layup-plus-foul in between. After a fastbreak floater from James made it 67-45, Nicolo Melli and Moss hit corner three-pointers for the visitors. But Causeur drove the lane twice, finishing one with the layup and the second with a pretty floater for the biggest margin yet, 74-51. Moss scored a fastbreak layup, and Gentile muscled in a runner, but Iverson had a put-back slam to keep the margin above 20 points. San Emeterio buried a triple, and Shengelia drove for a layup, making it 82-57. 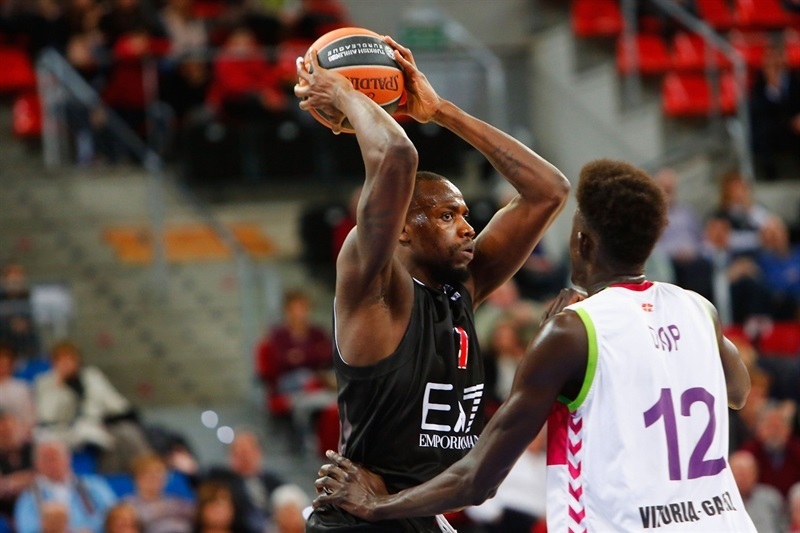 After Samuels fought inside to draw free throws and score a layup for the visitors, San Emeterio fed Ilimane Diop for a layup just before the buzzer to make it 84-61. Kleiza banked in a runner, but Adams knocked down a corner three. Brooks hit a tough long jumper for Milan, but Diop answered with one from mid-range and Adams nailed one from long range for a 94-65 advantage. After a timeout, Joe Ragland hit a three-pointer and Shawn James made a layup in the crowd, as Milan did not allow a field goal for more than three minutes. James scored inside again, and Bruno Cerella made a second-chance basket, but the game was well out of hand by that point with less than three minutes to go. Kleiza hit a jumper, but free throws from Adams got the host over the century mark, 100-76. In the final 90 seconds, Cerella and Begic traded easy layups, before Kleiza rounded out the scoring from way downtown. "I think we must feel satisfied for this win and how we made it. We managed to get a home win in the Top 16 against a big team like EA7 Milan. We played a very good first half, except a couple of minutes. In the second one we came up strong as well, and the best thing was the approach we had in the first minutes of the third quarter. We didn't wait for them, kept being aggressive. We wanted to work hard in defense too. The thing that worried me most was the offensive rebounding, because we face a challenge in that aspect in our next games, against strong contenders under the boards. We must analyze that, work on that, and improve it. The most important thing is that the team wins, because that gives us confidence and calmness. If we can make the people in the arena have fun and make it so more fans attend our games, that's awesome." 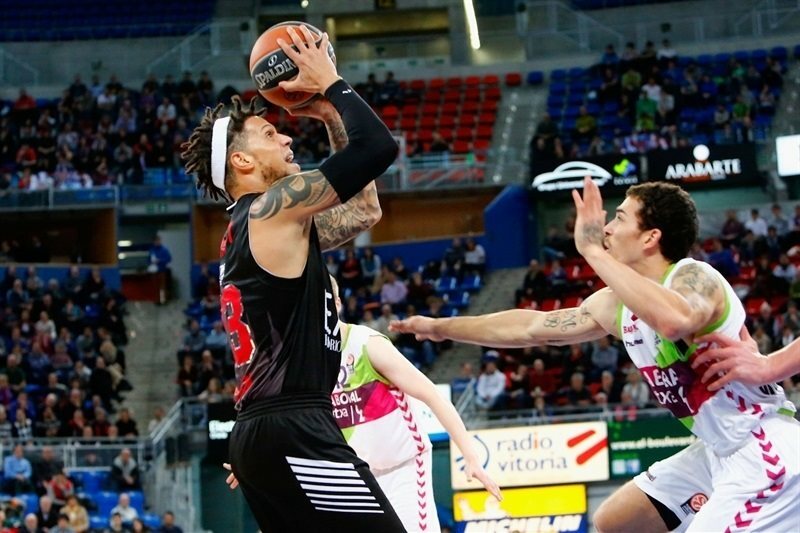 "Laboral Kutxa dominated the game for the 40 minutes. We were not able to play with the energy and confidence they put on the floor. 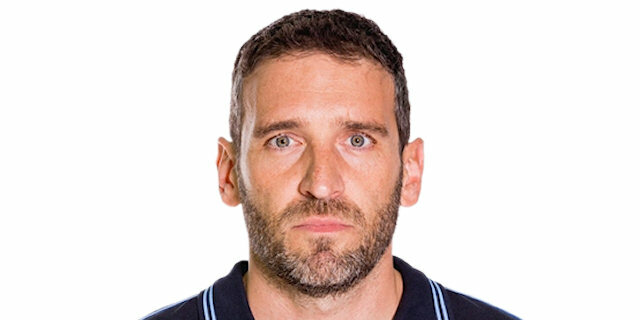 They are coming from a very positive period and we were not able to match their aggressiveness from the very beginning, when we committed too many mistakes. For us is unacceptable to receive 34 points in the first quarter. They had unbelievable percentages. It's very difficult to build something against that. We must get back to work and understand what our real level is, as we were not ready to compete, including mentally. We tried to stay motivated the rest of the game and get back, but it is complicated when you are down by nearly 20 points all the time, against a contender that knew how to create the right situation. The game was over after only 10 minutes." "I was taking the shots that I usually take. Today I just made them and that's it. After that I tried to put the ball on the floor and penetrate more, and other teammates were very accurate too, so it wasn't necessary to shoot anymore. We are getting better as a group and I think we will play more and more better games, but we still struggle to play 40 minutes well, even today we didn't accomplish that, but it was enough for us to win. We are not going to win many games if we just play 20 minutes well." "I don't really don't know what happened. There is nothing much to say. From the beginning to the end they killed us. It's really a bad moment for us, this was really a bad loss. We need to go back to the gym and start from the beginning. It's our fault to play such a terrible game. It's tough to think now about qualifying or anything else than just to focus on one game at a time. I think we need to be more humble, we looked arrogant and we didn't look like a team, everybody played for himself."